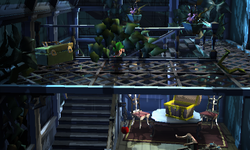 The Solarium is a room inside the Haunted Towers in Luigi's Mansion: Dark Moon. The Solarium can be accessed by taking the left door inside the Family Room or the left door inside the West Bedroom. The Solarium is a small room with three flights of stairs. On the third floor, there is a table with a hidden Treasure Chest on it, two chairs, and a vase. The stairs are retracted, but pulling the chain on the third floor makes them take their original place. On the fourth floor, there are many vines among other foliage. Several hanging plants are also present, and there is also a hole that reveals the West Bedroom on this floor. The door on the third floor takes Luigi back to the Family Room, and the door on the fourth floor takes him to the West Bedroom. In Pool Party, Luigi needs to use the Solarium to get to the fourth floor to reach the Rooftop Pool. Starting on Pool Party and most missions after, Luigi can reveal the missing chest on the third floor and open it for an emerald. This page was last edited on September 12, 2017, at 20:33.